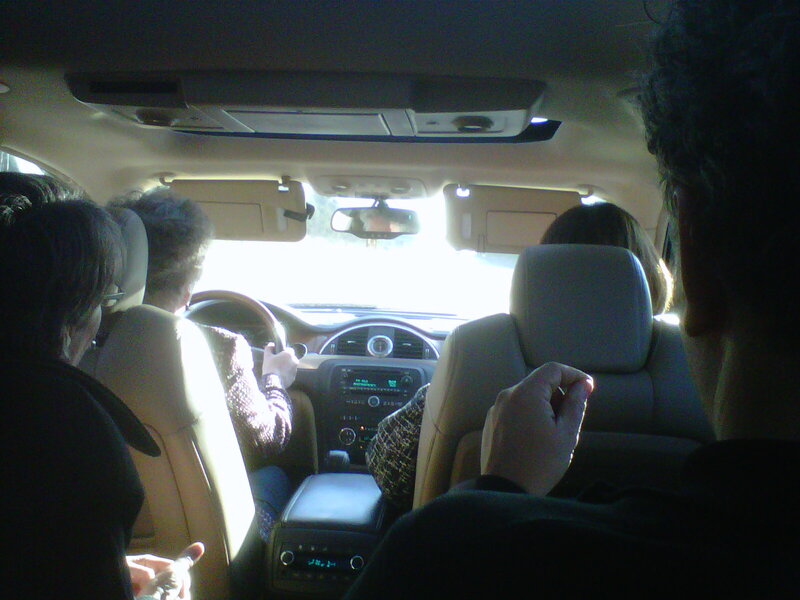 2012 JUNO Awards – Let the Games Begin! What an exciting time to be in Ottawa Canada for the 2012 JUNO Awards! Artistic Director Gerald Fagan and I arrived by VIA train, the Official Train of the JUNOs, Friday evening, in time to check into the Lord Elgin Hotel, one of the Official Hotels of the JUNOs ( are you noticing a trend here?) and the JUNO excitement is everywhere. 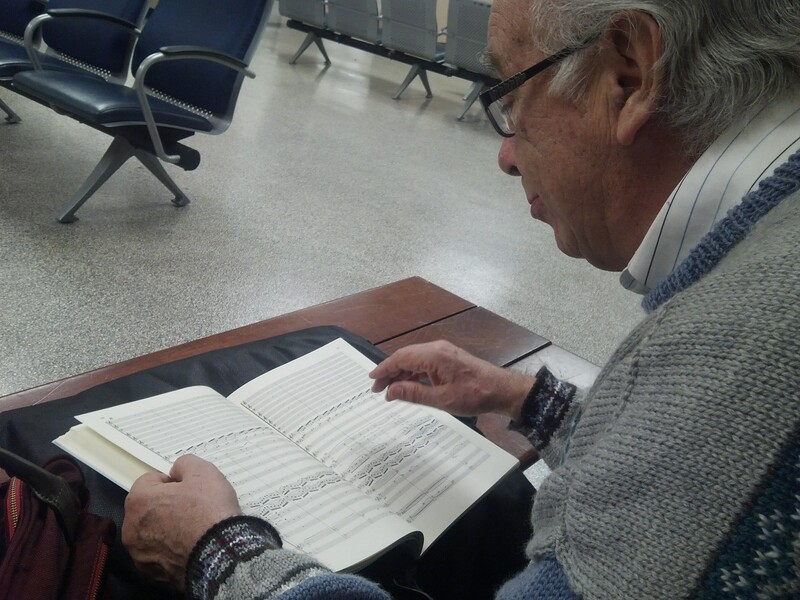 The train ride from London to Ottawa was very exciting – Gerry studied his music for the April 6th Good Friday Concert in London. The entire trip. I’m not kidding. Except for when he took a break to eat a peanut butter sandwich. Don’t believe me? Check these photos out for proof! Here he is waiting for the Toronto connection. 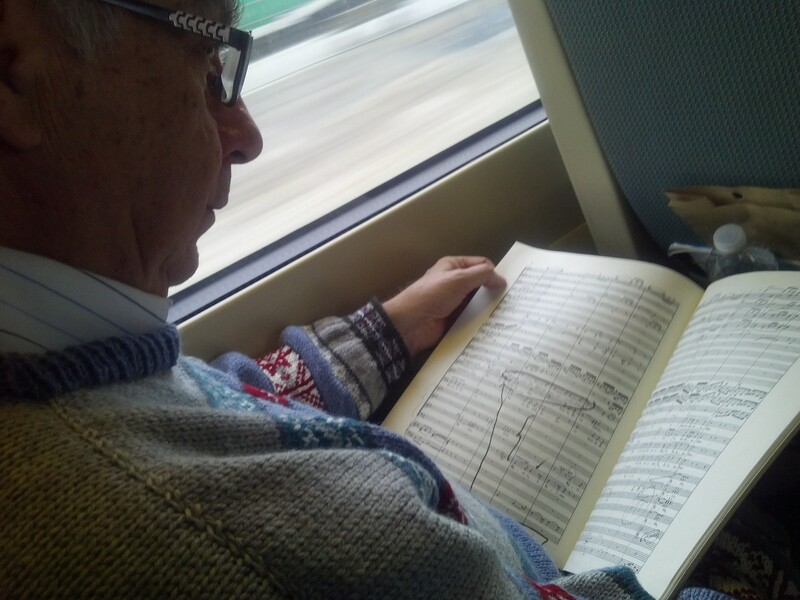 And once on the train again, out comes the music. 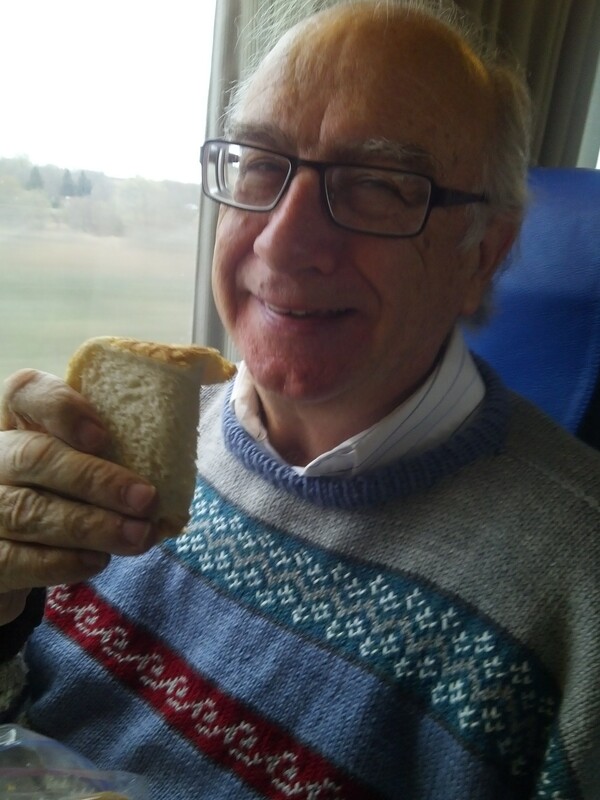 Nothing like a peanut butter sandwich! 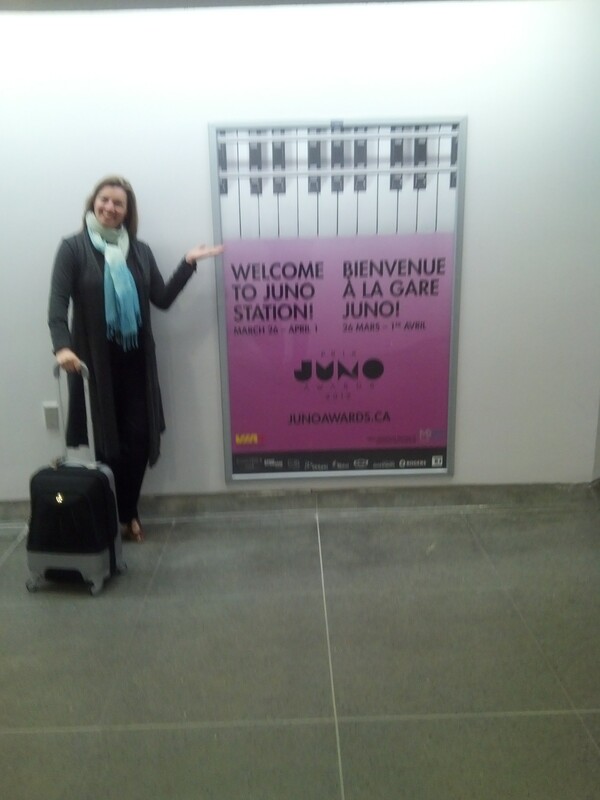 Upon arriving in Ottawa the JUNOs were there to welcome us! Here is a picture of Gerry! After taking this picture of me, saying that I should be sure to have my picture in our JUNO diary, Gerry took this one and declared ‘perfect!’. Hmmmm…. Our fantastic Board of Directors is joining the festivities as well. 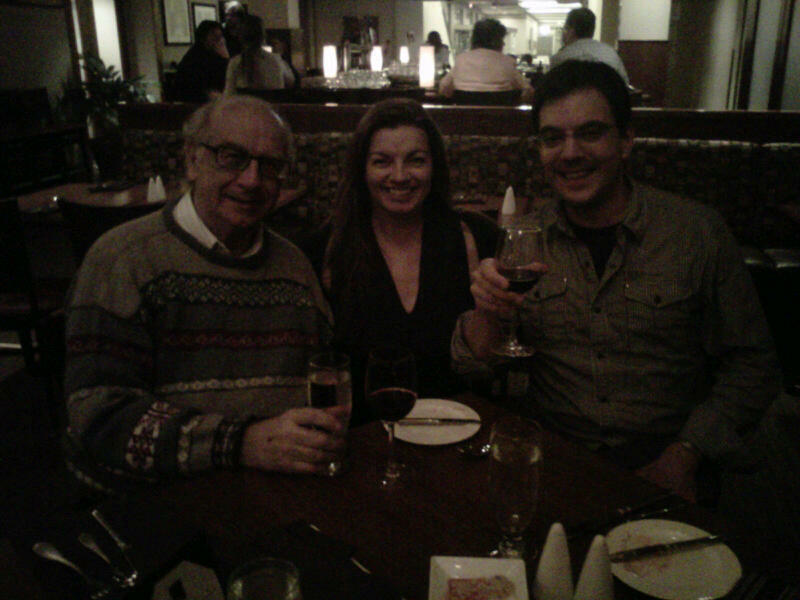 Board Member Paul Ciufo arrived Friday night and met us for a late dinner at the Lord Elgin, one of the official Hotels of the JUNOs. Our waiter very kindly captured this shot. He seemed somewhat nonplussed about our Official Status at the Junos importance. Luckily, the banana bread pudding with nutmeg ice cream by Chef Michael Smith was a balm to our hurt egos. Sigh. 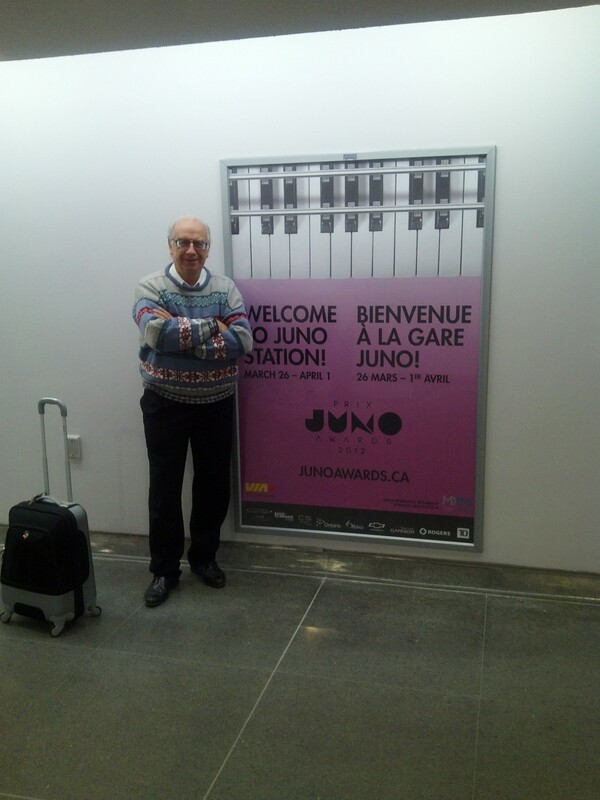 Not to be upstaged, a van of the Bach Music Festival of Canada Board Members left Exeter Ontario at 4:30am to arrive in Ottawa for our Classical Music Showcase, an Official event of the JUNOs! which is at 3:30pm at the National Arts Centre. Friedhelm Hoffmann, Heather Moffatt, Cathy Seip, Ellen Shapiro and Jean Jacobe along with Paul and Wayne Deluca and Janet Heerema are the most extraordinary Board of Directors that any organization would be so proud to be associated with. What an effort for each to make, to support the Festival as well as the efforts of Canadian contemporary classical musicians! We will miss Board members Janet Heerema and Wayne DeLuca’s presence here – but he is cheering us from away! Previous postBach Festival at the JUNOS! Next postClassical Music Showcase Conquers!